"Make your own honey graham crackers at home! 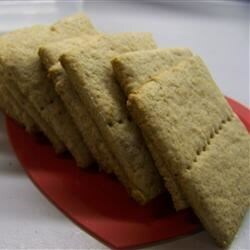 These are simple to make, and can be used in recipes that call for graham crackers." Sift together the whole wheat flour, all-purpose flour, baking powder and baking soda; set aside. In a medium bowl, cream together the margarine, brown sugar and honey until light and fluffy. Stir in the sifted ingredients alternating with the milk and vanilla. Cover dough and refrigerate overnight. Preheat the oven to 350 degrees F (175 degrees C). Divide the chilled dough iinto quarters. On a well floured surface, roll the dough out one quarter at a time iinto a 5x15 inch rectangle. Divide into rectangles using a knife. Place rectangles ointo ungreased cookie sheets. Mark a line down the center of each one, and prick with a fork. For a cinnamon flavored cracker, sprinkle with a cinnamon sugar mixture before baking. Bake for 13 to 15 minutes in the preheated oven. Remove from baking sheets to cool on wire racks. These delicious chocolate-covered crackers are so easy to make. Excellent. Tried making graham crackers with another recipe and were very bland and soft, these were tasty and crisp, just like store bought! Definitely top with cinnamon and sugar. Really good, kids had fun making and eating! Also an easily handled dough, and edible raw-no eggs. We even cut out initials and made homemade shapes. Delicious... crispy and sweet. I only used whole wheat flour, but was still impressed with this cracker.